Charity contests have become standards of nonprofit fundraising and corporate social responsibility efforts over the past several years. They range from the granddaddy of them all, The CASE Foundation's America's Giving Challenge to the now-defunct Pepsi Refresh and the long-running Tom's of Maine's 50 States for Good. One of the newest is Birdies for Charity by John Deere. Many charity contests are now listed at crowdfunding sites such as Crowdrise. Charity contests have suffered their share of controversy and painful learning but laid the groundwork for the wildly popular "Giving Days," such as #GivingTuesday. Both kinds of charitable crowdsourcing now exist, giving nonprofits numerous options for participation. Many corporations still find value in charity contests and include them in their portfolios of corporate giving programs. In fact, companies have gained an even higher opinion of partnering with social causes. That's because the younger generations, such as Millennials and Generation Z value experiences over things, love helping to make the world a better place, and they are skilled at using social media. Of course, social media created charity contests in the first place, so it doesn't seem as though social cause-based social media campaigns by companies are in any danger of becoming obsolete. Companies realize that social media campaigns centered on social causes create incredible customer engagement. What is the difference between a corporate sponsored charity contest and a community based giving day? Besides the fact that a contest takes place over a period, such as a month, people vote for their favorite charities in the contest, resulting in a grant from that company to the charities with the most votes. During a giving day, individual charities solicit donations directly. 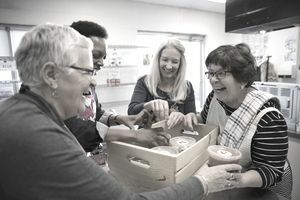 The sponsoring organization, often a community foundation, manages the campaign, sometimes even providing a central portal through which the donations flow. Charity contests are no slam dunks but, if nonprofits prepare for them appropriately and understand the pitfalls as well as the pay-offs, they can serve as welcome sources of additional funds for a reasonable outlay of effort. Charity contests depend heavily on a nonprofit's ability to use social media to rally its troops and get votes. So I asked three nonprofit experts with experience in cause marketing, social media, and charity contests to provide their best tips for any nonprofit that is thinking about getting into a charity contest. "In terms of using social media for contests, nonprofits have to be astute. While they can easily reach out to an existing fan or donor base, they also don't want to contribute to communications fatigue. Yes - this contest (and others) can provide a big win for organizations, but you don't want to bombard your truest supporters with directives to go vote repeatedly. "Nonprofits who understand this mention the contest in a way that is relevant, deliberate, and timely. Rallying the troops before the deadline or upon initial launch has the added incentive of timeliness. Showcasing your good ideas for what to do if you win helps the voter/supporter understand why you're deserving and may tempt him or her to take the initiative to vote regularly. And making sure that you thank your voters as much as you ask them to vote is also important. Let people know you are appreciative of their time and energy to show their support - whether you win or not." Work Inside Out: Start with your best and most loyal supporters and work your way out to contacts and finally to people you don't know. Work from warm to cold. Not only are your supporters more likely to vote for you, but they can get votes from their own inner circle. Social Networks Are Key: After email, reaching out to people via Facebook, Twitter and Foursquare may be the most important thing you can do. If you're asking what social networks are, you may want to sit this contest out until you have a stronger online presence. Ask for One Thing: Too many nonprofits make it too complicated to help them. I read a text giving program the other day that had 16 steps! The only thing voters should have to do is vote. They shouldn't have to mail anything back to you, paste a URL, or give you their mother's maiden name. Make it quick and easy and the votes will pile up. Don't Forget the "Fun" in Fundraising: Contests are like events; people should have a good time. Add some rewards, incentives, and prizes to your contest efforts. Show people you appreciate their support and make them want to help you. Do the ROI analysis first. Ask and answer if it is worth it before you jump in. Have Your Network in Place Before You Need It: Build your team of staff and volunteers, but also people that you've connected with through social networks who can be your brand advocates. Don't forget about working with free agents too. Use Storytelling: The most effective pitches feature real people telling their personal stories about why they care about your cause and what can be done with the money if your organization wins. Say Thanks in Creative Ways: Thank donors publicly, but also thank people who ask others - make them role models for others. Charity contests are not a sure bet. Be prepared for not winning anything. But, even if you don't, you might learn about social media, about your community, and end up being better prepared for the next contest or giving day, and for your other fundraising campaigns.